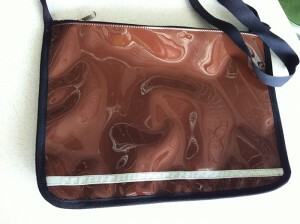 Vintage canvas has always been the base of RonDSwan’s products, and indeed passion. 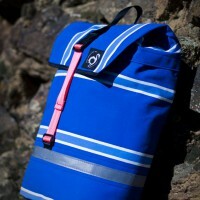 We’ve revived a couple of special vintage colours and will be adding new ones here and on our facebook page as well. 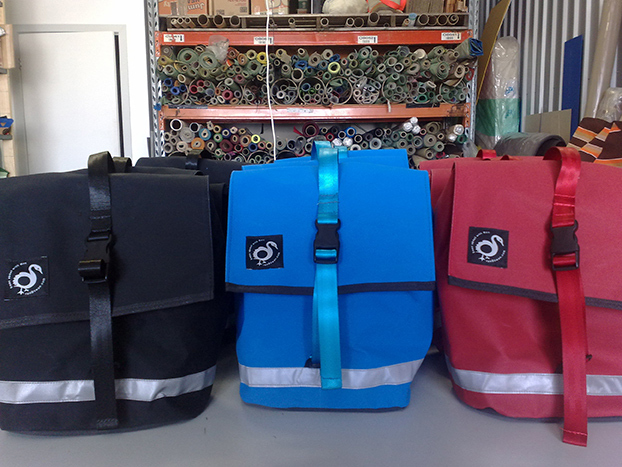 To purchase one, contact us via email, phone or order a vintage pannier voucher and let us know the name of the colour you’d like. This beautiful blue is one of the original colours in the 1960’s that Brella made and was discontinued not far into the 1970’s. The photo was taken by the very talented Oliver Holmgren. 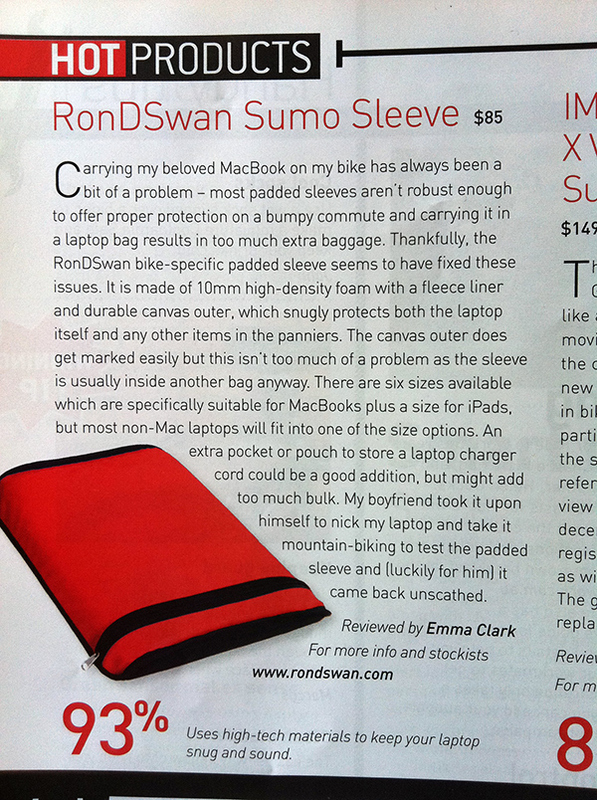 RonDSwan is excited to be a last minute addition to the Bike Market at Sustainable Living Festival, Fed Sq Melbourne this weekend 17-19 February. 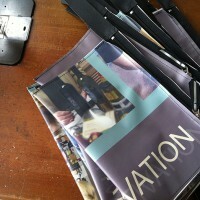 The next issue of Treadlie magazine is out and it’s a fantastic edition as usual. They’ve been kind enough to include RonDSwan’s ipad sleeve as well. 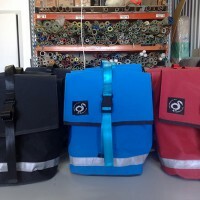 New pockets for Commuter Panniers made from clean discarded banners. 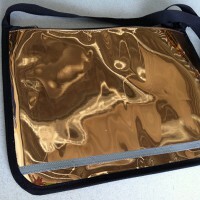 OK, these musettes are actually flat fabric but our reclaimed metallic and shiny do wierd things. Just a child size handful of these special colours. 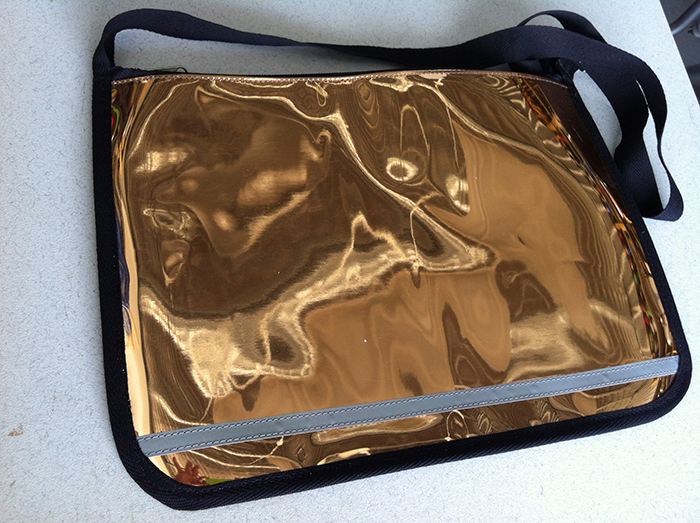 If you’d like one, just order a Chrome Musette and then write “It just has to be GOLD (or) BRONZE (or) MELTED CHOCOLATE” in the comments section. We love that the reviewer tested the sleeve on a mountain bike trip and her laptop came back unscathed. Click on image to read review. 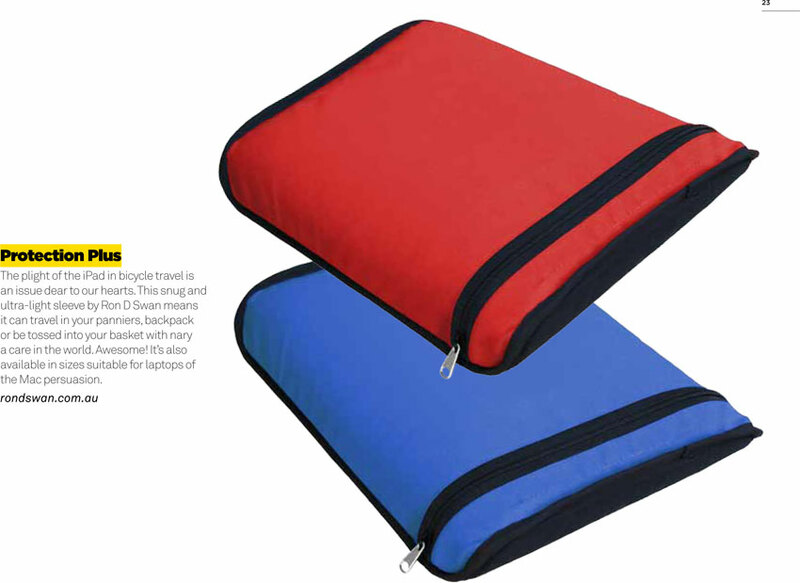 …just a note on colours: the black and blue will wear better than the red. 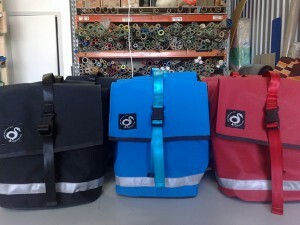 Ron D Swan has a new range of panniers swanning their way to Ausbike Expo. 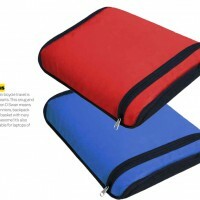 They’re heavy duty canvas and made for low rider front pannier racks. Sturdy as well as very cute. When is a bike lane a bike lane? 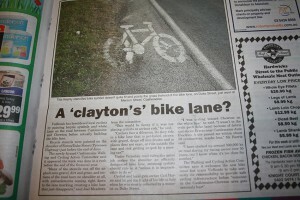 on Aug 16, 11 in News by Cathy with Comments Off on When is a bike lane a bike lane? When is a bike lane a bike lane? When a stencil marks the side of the road of course! 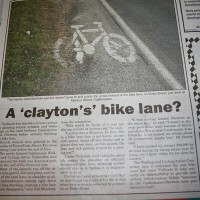 This article appeared in one of our local papers after media releases from our newly formed “Mount Alexander Walking and Cycling Action Group”. 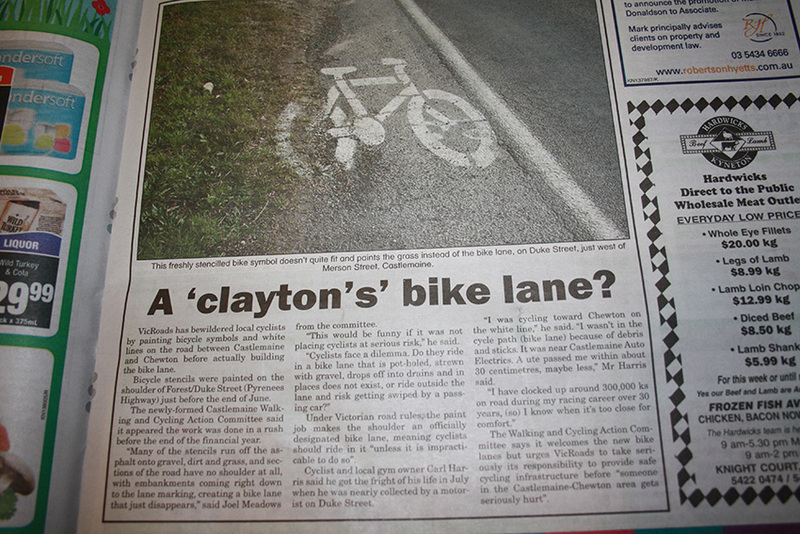 VicRoads, the authority wielding the stencils says there is more work to do. 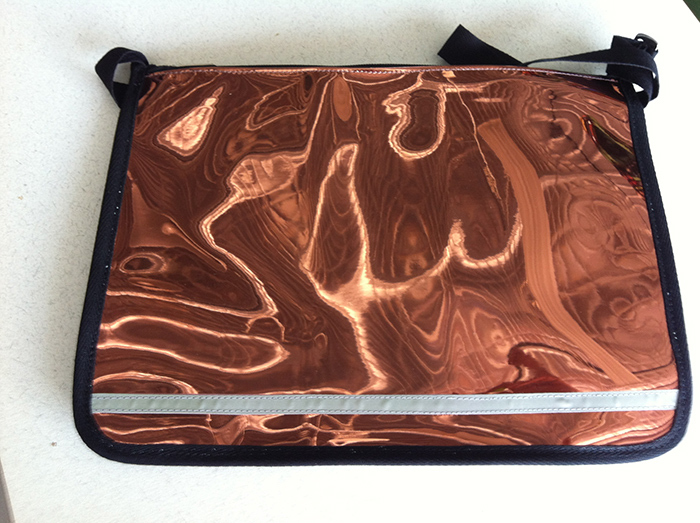 a unique design that hits all the marks – function, materials, usability, manufacturability, and durability. 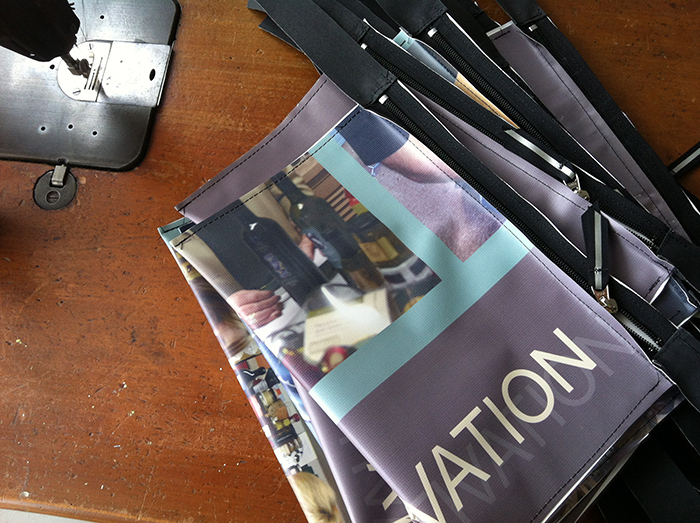 If you’re planning on coming to Ausbike next week, we look forward to meeting you and you can try one out for size. Ron’s newest stockist is a little different. The store stocks products that are part of a Shaker Philosophy (above). Usethings in Castlemaine is a store where you won’t be asked “do you want fries with that?” but possibly rather “do you really want those fries?” (if in fact, they did sell fries). Tim and Deb wrestle over the question of what products are really, truly useful – not just right now, but far into the future of that products life. 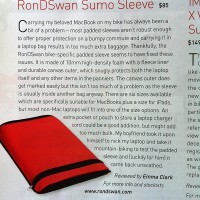 Ron is very proud to be represented in their collection.